as I shake out the rugs. rustles newspapers on the table. to reveal features of a man I've never met. I find only her mother's blondness, a few freckles. I want to present gift—animal crackers, maybe. and besides, Aria hasn't grown a tooth. plodded us this way, to this juncture, this. I close the front door. minor intimacies draw my way. A painting tilted in the living room, that's one. of sweet applesauce I find, later, inside the cupboard. whose necks bow as cut sunflowers. hardly cushions when sleep comes. New York and its handsome ugliness. Copyright 2009, Brandon Lewis. © This work is protected under the U.S. copyright laws. It may not be reproduced, reprinted, reused, or altered without the expressed written permission of the author. 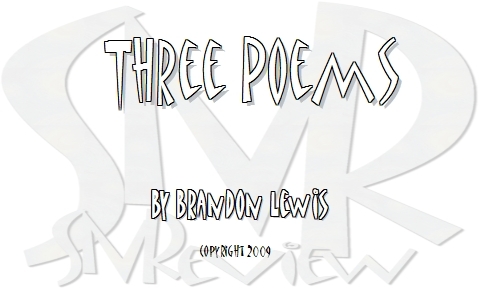 Brandon Lewis is a native of Milwaukee, Wisconsin and is former Poetry Editor of Porcupine Literary Magazine. After received his MFA in poetry from George Mason University in 2008, he continues to write poetry, drawing much inspiration from other art forms. His poems and French translations can be found in journals such as Poet Lore, Oranges and Sardines, Water~Stone Review, Borderlands, and Phoebe. Brandon Lewis lives in Washington, DC.